This is the site of the first courthouse established in the Western Michigan Territory in 1825. The building you see here is not the original courthouse, but this building is a historic structure. It is a granary from Door County and is over 100 years old. The presiding judge o [sic] this circuit court was James Duane Doty and his circuit was Prairie du Chien. Mackinac Island and Green Bay. 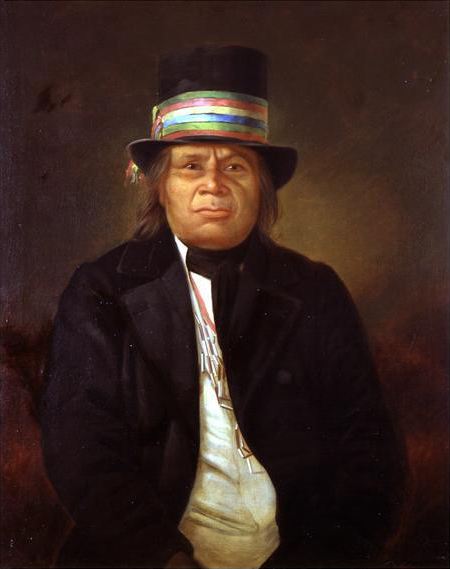 The most famous trial held here was the Trial of Chief Oshkosh in 1830. The furnishings in the courthouse are replicas; however, they were reconstructed from an original 1824 Work Order. Notice the judge's bench, clerk's desk and witness chair to your left and the prosecuting attorney's and defendant's trestle tables to your right. The Courthouse is located at Heritage Hill State Park at 2640 South Webster Avenue, Green Bay, Wisconsin 54301. NOTE: There is a fee to enter the park. The media file is in the public domain. The Courthouse is located in the La Baye section of Heritage Hill State Park.